I was there opening weekend in 1989 when The Dorothy Chapman Fuqua Conservatory opened...to great fanfare—20,000 visitors that weekend! 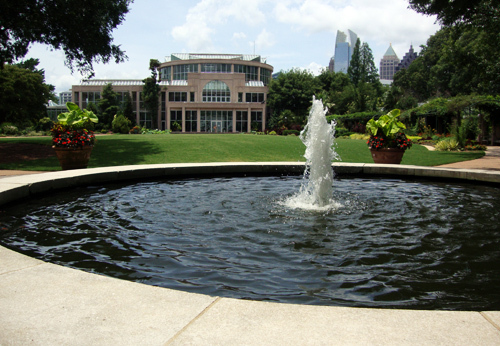 The Fuqua Conservatory put the Atlanta Botanical Garden on the map. The Conservatory was possible through a very generous gift of $5.5 million from businessman, politician, and philanthropist John Brooks "J.B." Fuqua (1918-2006) in honor of his wife. You'll find a portrait of Dorothy in the Fuqua Orchid Center near the Georgia-Pacific Classroom. Its design features the neoclassical character of the late 19th Century, but don't let that fool you. It's as modern as modern gets...the technology to control the sensors that regulate the temperature year-round is hidden, but nonetheless fascinating. Inside the 16,000 square feet of display area, you'll find five distinct areas. They include the Lobby, the Orangerie, the Special Exhibits space, the Desert House, and the Tropical House and Rotunda, which features tropical plants from all over the world.